Cook at home and save money! There are plenty of recipes to choose from for your brown bag lunches. 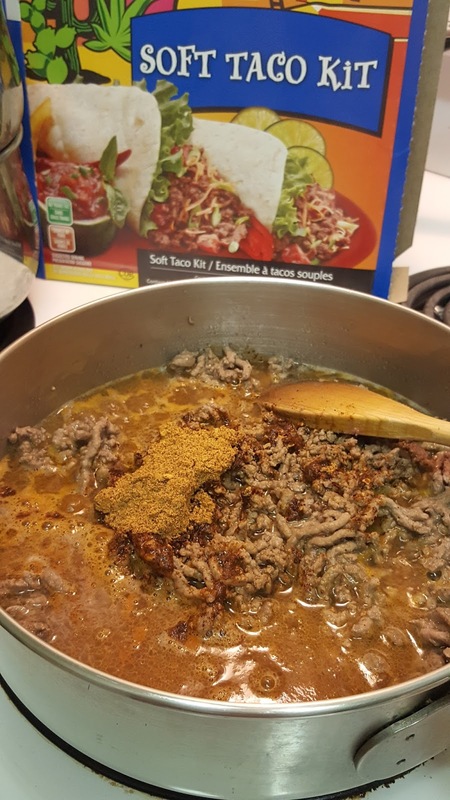 Save On Foods had Western Family Soft Taco Kits on sale for $3.99 so I thought I would go ahead and give them a try. My husband was a bit wary of a packaged kit however I reassured him that buying the seasoning and tortillas separately would cost more and this was a budget cost saving technique. So onwards with the kit. The first thing is to pan fry the 1 lb of ground beef until it is brown. After that you add the seasoning package with 1 cup of water and let that simmer down. 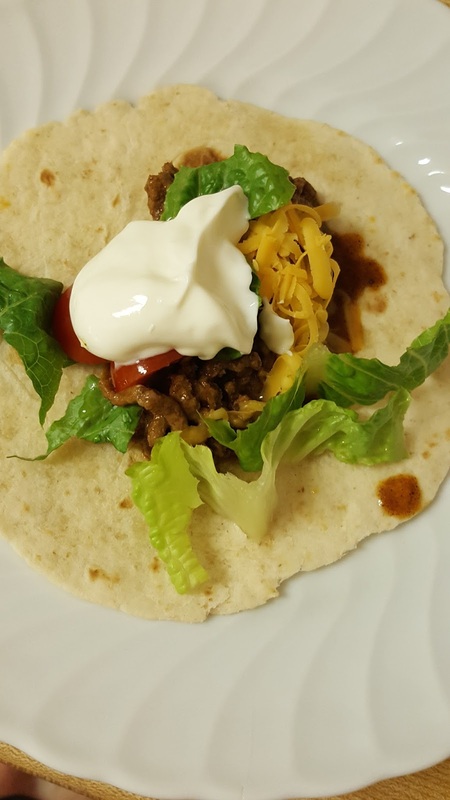 What you will realize later is that it is good to have a saucy meat sauce since the flour tortillas are heartier and perfect for soaking up the sauce. Then it is time to prepare the assortment of toppings. I had chopped romaine lettuce, chopped cherry tomatoes, grated cheddar cheese, sour cream and the packaged salsa from the taco kit (no one touched this salsa and I ended up throwing it away, hint, get a different salsa). I warmed up the tortillas by heating them up in the oven on a baking sheet so when it was ready to put together the soft tacos at the taco bar. 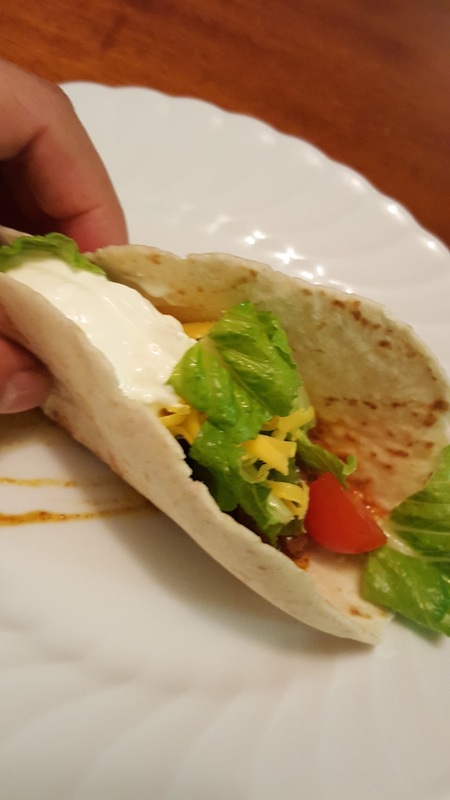 Everyone puts on the toppings of their choice and then moves along with enjoying their soft taco dinner. I follow different restaurants and chocolatiers on Instagram because food pictures can be inspiring. One Saturday I saw some gorgeous pics of special dessert jars on Beta5 Chocolates and wished I could try one. Beta5 sells out quickly and they did of their one day dessert specials. That's when I started to "google" dessert jar recipes that would be easy to make at home. I stumbled upon Season with Spice Banana Split Parfait and that is how I came to make my own banana split dessert jar inspired from the recipe. It was delicious! I definitely want to try making more dessert jar desserts. 1. Whip the whipped cream with a mixer on high speed. Halfway through I added the icing sugar and vanilla and then finished whipping the cream til stiff. 2. Layer the mason jars. Bananas, whipped cream, strawberries, whipped cream, bananas, whipped cream, and walnuts on top. This was a real treat and my guests loved my very first dessert jar. 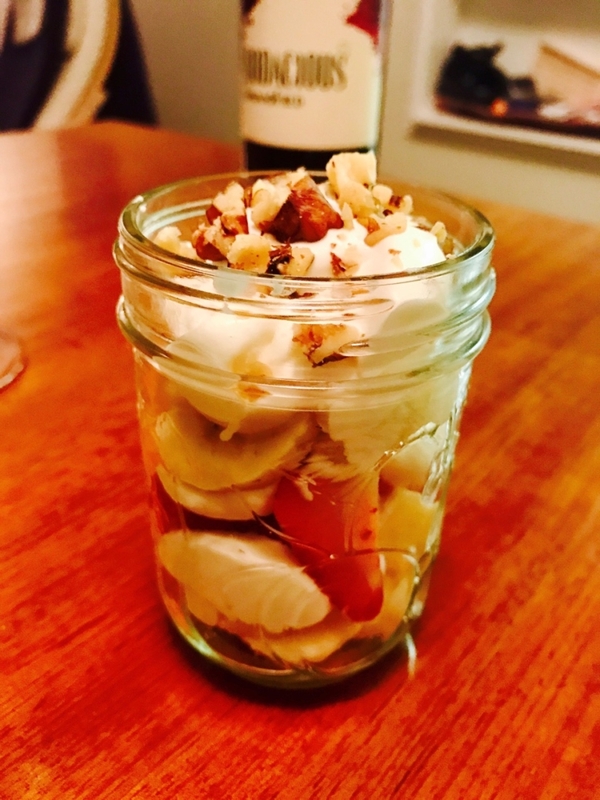 With those ingredients you can't really lose, give it a try and you'll be deliciously surprised with your own banana split parfait dessert jar. In Chrissy Teigen's Cravings Cookbook, this is one breakfast recipe that stood out, maybe because it seemed to me to be more of a dessert than a breakfast oatmeal. Why did I think so? Because of the yellow cake. My friend made this recipe the first time I tried it and I ate it as though it was a dessert. It was delicious! I brought some home and warmed it up with vanilla ice cream on top. She used a can of peaches which naturally sweetened up the dish. Since peaches were in season, I bought a few with fresh raspberries and decided to try this out for myself. What did I learn? I love the combination of peaches and raspberries. I love eating this dish when it's freshly pulled out of the oven and it's warm and drizzling. That is the best! I wish I had reduced the recipe because the Yellow Cake Baked Oatmeal truly feeds a crew of 8-10. And the oatmeal is filling enough. I did have this for leftovers for the week but the best moments were right when it came out of the oven. 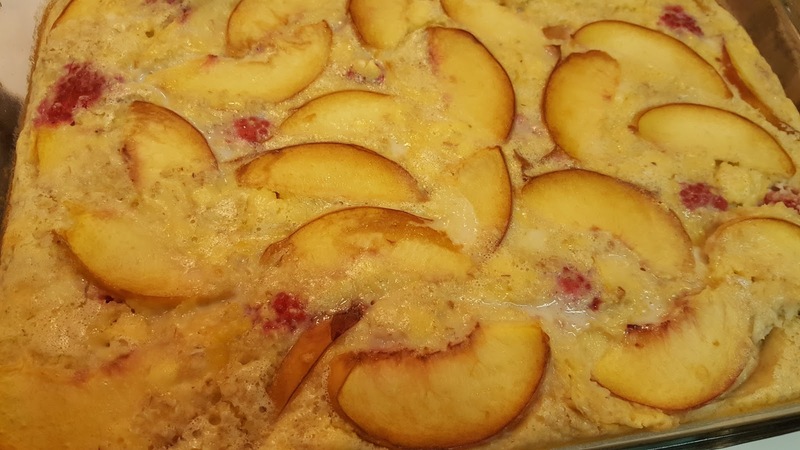 So if you're feeding a bunch of people and you want to make something easy and filling, then whip up a batch of Chrissy Teigen's Yellow Cake Baked Oatmeal. For an easy dinner we bought a roasted chicken from the supermarket and a potato salad. I bought most of the ingredients for the Cravings Cookbook Butter Lettuce with Blue Cheese and Cayenne-Candied Walnuts, okay, I didn't buy blue cheese because I didn't want to pay $6 for a block of blue cheese when I only needed a few crumbles. I substituted feta cheese that I already had at home instead. When I got home I also realized that I didn't have cayenne pepper so instead I used paprika to spice up the walnuts. This salad gave our dinner some colour and it was a beautiful addition to the chicken dinner. It was easy just like all of the other recipes I've tried so far in the Chrissy Teigen's Cravings Cookbook. I just washed the lettuce, sliced half an apple, crumbled a bit of feta, and then tended to the main attraction, the candied walnuts. The candied walnuts makes this salad stand out. The combination of candied walnuts and apples with fresh leafy greens is perfect! 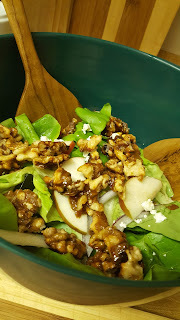 My husband kept asking me if I made the walnuts, I guess, this salad looks so gourmet that no one would believe that it is possible to whip it up in your kitchen. Seriously I just followed Chrissy's simple instructions which was to heat up a pan with 1 tablespoon of butter, 1/4 cup sugar, and 1 cup walnut halves. Stir until the walnuts are roasted on medium heat. 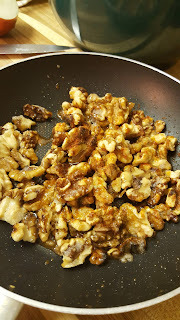 What happens is that the sugar and butter carmelize the walnuts. Then you add the secret ingredient of paprika (which should be cayenne) to spice it up. Toss it on top of the butter lettuce salad. WOW! This is the star of the meal! The one thing I hate about getting a rotissierre chicken for only two people is that if we don't plan well, too often I find that I throw away chicken at the end of the week. The first night is always the easiest as a quick meal but as the busy work week continues, the chicken starts to get old pretty fast. Well after seeing Chrissy Teigen's recipe that asked for a rotissiere chicken I no longer had to cringe or think that my chicken would go to waste. 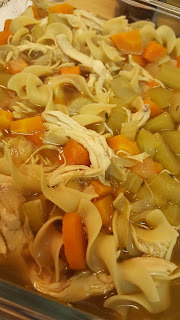 It is Chicken Noodle Soup that asks for the meat from a rotissiere chicken. Yay! I had "Better than Bouillion" Chicken soup paste that I used as the chicken stock base. Everything was super easy. Saute 1 onion and 4 garlic cloves (minced) in a soup pot. Add 5 chopped carrots, 6 chopped celery sticks, 1 tsp thyme, 1 bay leaf, 10 cups of chicken stock and let simmer on the stove for 45 minutes. The last addition is 2 cups of broad noodles and the shredded chicken (approximately 2.5 cups) - in my case it was essentially both chicken breasts and simmer for 10-15 minutes. The outcome is an amazingly easy chicken noodle soup. It makes a large stock pot full. I will be giving some to a friend at work, she made me Hong Kong style soup before so it is a nice way to return her mason jar. We also have plenty left over for lunches and dinner. In the Cravings Cookbook Chrissy Teigen says she will eat this all week long. I'd rather pass along the good stuff while it's freshly made and then move on to another recipe in the Cravings Cookbook. I have this cookbook for 4 weeks from the library and am motivated to try as many recipes as I can. The Chrissy Teigen Cravings Cookbook journey continues. I'm loving every minute. 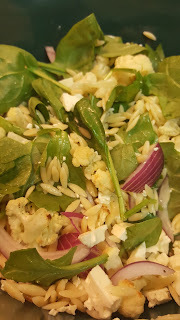 The recipe I choose for the Cravings Cookbook Club was the Roasted Cauliflower, Feta and Orzo Salad. I wanted to bring something light and healthy. This salad fills the bill. It is refreshing and lightly dressed with a lovely olive oil, lemon, dijon mustard dressing. In the summer, when you may not want to turn on the over, this recipe is the best fit because you can roast the cauliflower first thing in the morning when it is still cool. That is what I did. The surprising thing is that roasted cauliflower actually shrinks. It is easy to do. I chopped up 5 cups of cauliflower and tossed it with pepper, salt and 3 tablespoons of olive oil and baked it in a 400 degree oven for 20 minutes. 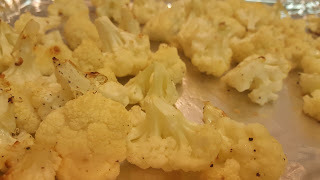 Voila, roasted cauliflower that is perfect for your salad. I forgot the garlic, but you don't have to. Either way, it is still quite tasty. 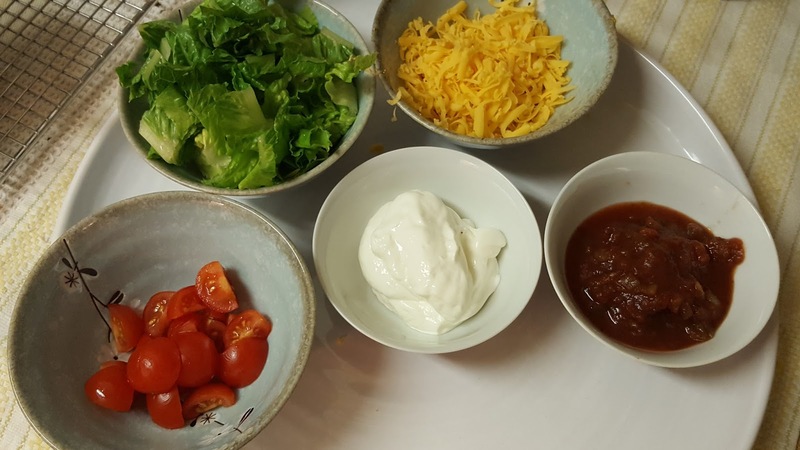 After the cauliflower cooled, and when it was closer to our afternoon cravings cookbook meeting time, I put together the rest of the ingredients in a salad bowl. Roasted cauliflower, cooked and cooled orzo, feta cheese, red onion, and fresh baby spinach. At first without the spinach, the salad looks white, but then you add the fresh greens which gives the salad the boost of colour. I never knew that fresh spinach could wilt nicely with the weight of the orzo and cauliflower. I thought it only wilted when cooked. I learn new things every time I cook. Even though I did not include the dried cherries, everything else I more or less followed according to Chrissy Teigan's instructions. And I was impressed. A lovely summer salad that would be perfect for lunches! Great healthy salad to share with others. Thanks to Chrissy Teigen's Cravings Cookbook. This has been so much fun exploring the recipes of the Cravings Cookbook. The hardest decision is deciding what to cook next. 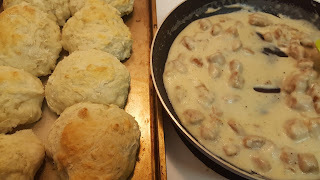 The first recipe I decided to try from Chrissy Teigen's Cravings Cookbook was the Pull-Apart Buttermilk Biscuits with Sausage Gravy fro breakfast. I haven't baked any type of bread in so long but this recipe for buttermilk biscuits didn't require any yeast or rising time. It was a simple recipe that even I could make. That being said, I did mess it up. Chrissy Teigen's Cravings Cookbook is nicely laid out with the instructions on how to make the buttermilk biscuits, sausage gravy and maple cream. However I got a bit foolish by mixing ingredients and not reading properly. I accidentally added 2 cups of buttermilk to the biscuit mix instead of 1 and a half. No worries, I just added extra flour when I needed it and it worked. The biscuits still baked beautifully. Phew! Instead of making maple cream, I just brushed straight maple syrup on the tops of the biscuits before baking them. This gave them a nice golden glow on top. When I started making this breakfast, my husband was skeptical reminding me of a time when we in the USA and ordered biscuits and gravy and wondered about it all. I have a poor memory and forgot all about that incident. All I knew was that this was a true down south American breakfast that I wanted to try at home. He commented on the white gravy and how it wasn't delicious so these were the words I heard before I made Chrissy Teigen's Cravings recipe. What did I do? 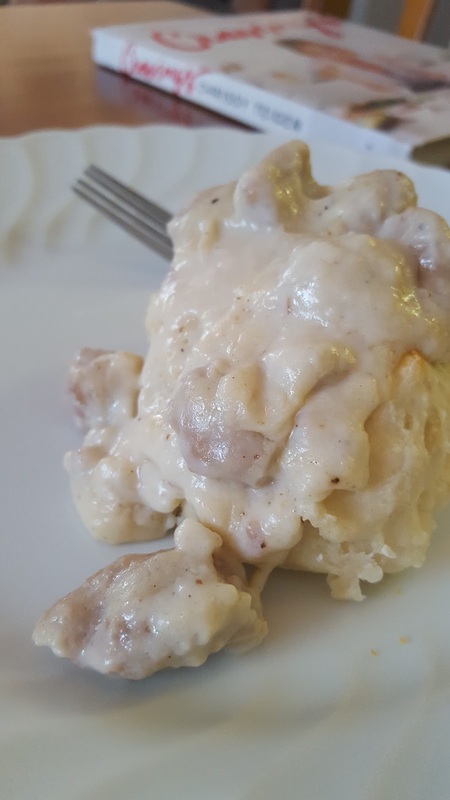 I decided to make less gravy so the sausage gravy had more sausage instead of sauce. Instead of 3 cups of milk, I only used 2 cups of milk for a thicker sausage gravy. And the end result, it worked! What did I learn? Cravings cookbook recipes are hard to screw up even for a lazy gourmet and beginner homechef like me. My hubby ended up eating two full biscuits with sausage and gravy. It was more delicious that his memory and gobbled up this American classic. Will I make this again? I feel that this breakfast is quite hearty and sinfully delicious. I feel a bit guilty since I didn't serve it with a fruit salad or anything colourful. I feel I need a green smoothie to make up for it.